US President-elect Donald Trump expressed his support for the completion of the Dakota Access Pipeline (DAPL) ahead of an evacuation order, due to go into effect on Monday, against thousands of people protesting the oil pipeline project. The Dakota Access Pipeline is a 1,172-mile underground pipeline under construction that would connect the Bakken oil fields in North Dakota to southern Illinois, passing through the states of South Dakota and Iowa. It would also pass through North American tribal lands, including the Standing Rock Indian Reservation of Sioux tribes that includes parts of North and South Dakota. The pipeline has been financed by a consortium of 17 banks, including Citibank, Wells Fargo, Royal Bank of Scotland, BNP Paribas and Société Générale. Additional capital is due to be raised from the partial sale of Energy Partners to a joint venture of Marathon Petroleum and Enbridge. The latter company was responsible for an 800,000-gallon oil spill in Michigan in 2010. Protests initiated by the Sioux tribes in April have attracted thousands of supporters who have gathered at camp sites near a portion of the pipeline. They have expressed opposition to the pipeline’s construction out of fear that leaks will contaminate the reservation’s only water supply—Lake Oahe, formed by a dam on the Missouri River—and destroy cultural sites. This weekend, hundreds of US military veterans are planning to join the protests, organized by the Veterans for Standing Rock. Members of the organization have already begun constructing more permanent buildings to house the protesters. They have also said they plan on staging a demonstration Monday and will be forming a wall to block police from attacking protesters. Under the watchful eye of the Obama administration, protesters have been subjected to brutal violence from local police and the National Guard, including the use of water cannons in freezing weather, tear gas, rubber bullets and concussion grenades. Many protesters have been seriously injured in clashes with police, who have arrested at least 525 people since August. Police have deployed armored vehicles, and the Federal Aviation Administration has declared the area a no-fly zone, banning the use of drones to photograph the campsite and document the police response. North Dakota Governor Jack Dalrymple and the US Army Corps of Engineers—a federal agency under the control of the Defense Department and therefore the Obama administration—have set a December 5 deadline for the end of protests and the evacuation of those attempting to block the pipeline’s construction. While officials issued the evacuation order on the grounds that it is necessary to protect “public safety,” and the US Army Corps has denied plans to seek the “forcible removal” of the camps, they want to force out protesters and create conditions for the arrest or violent dispersal of anyone who remains. The governor cynically justified the evacuation order by claiming that the camps do not possess “proper permanent sanitation infrastructure,” but the state is simultaneously moving to prevent the transport of supplies to the protesters. The state has said that, beginning Monday, it will inform those traveling to the site that they could face fines of up to $1,000. 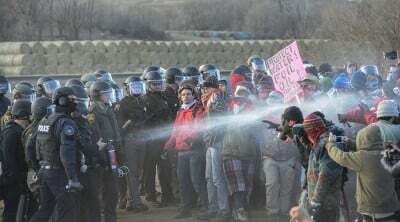 A North Dakota sheriff has said that the December 5 deadline is intended mainly to reduce the federal government’s legal liability for the protesters should they suffer injury or death as the cold Dakota winter sets in. The state has also stopped snowplows from clearing about a mile of highway leading up to the camps, absurdly claiming that workers do not feel safe approaching the area. The implementation of the evacuation orders follows a decision earlier this week by US District Court Judge Daniel Hovland to reject a temporary restraining order that would prevent police from using impact munitions, including rubber bullets, water cannon and concussion grenades. The judge rejected the suit, filed by the National Lawyers Guild, on technical grounds. While an incoming Trump administration will no doubt move aggressively to ensure construction of the pipeline, the Obama administration has been fully complicit in the police assault on the protesters. In early November, Obama said that his administration would “let it play out for several more weeks” before deciding on whether to issue an easement to move forward with construction under Lake Oahe. Native American tribes in the United States suffer from deplorable social conditions that are the legacy of American capitalism’s blood-soaked rise as a continental power. They have some of the highest rates of poverty, unemployment and other indices of social distress. More than 40 percent of the population in the Standing Rock Indian Reservation has an income below the official federal poverty rate, while one report estimated that the real unemployment rate was as high as 86 percent.